Those awaiting results of October 2014 CPA board exam - Certified Public Accountants licensure examination may find here complete list of passers, top 10 (topnotchers), performance of schools and top performing schools as the Professional Regulation Commission (PRC) and the Board of Accountancy released results in 3 working days after the exam. PRC on early Thursday announced that 4,123 out of 11,137 passed the Certified Public Accountant Licensure Examination. CPA board examination was administered in the cities of Manila, Baguio, Cagayan de Oro, Cebu, Davao, Iloilo, Legazpi, Lucena and Tacloban on October 4, 5, 11 and 12, 2014. CPA Board exam covers the following subjects: theory of accounts and auditing theory (Day 1), management services and practical accounting problems I (Day 2), auditing problem and practical accounting problems II (Day 3) and business law and taxation (Day 4). 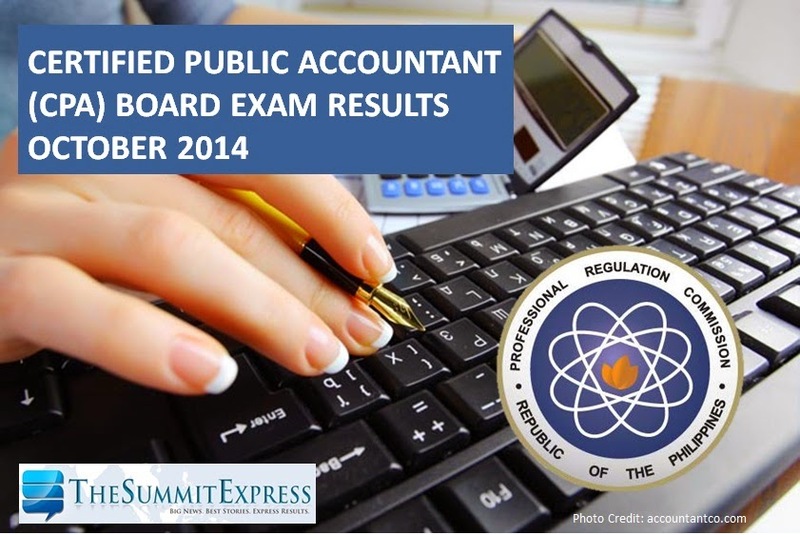 In the July 2014 CPA exams, results were released in three (3) working days after the last day of examination. PRC named a total of 1,107 out of 5,540 who have passed the Certified Public Accountant Licensure Examination.